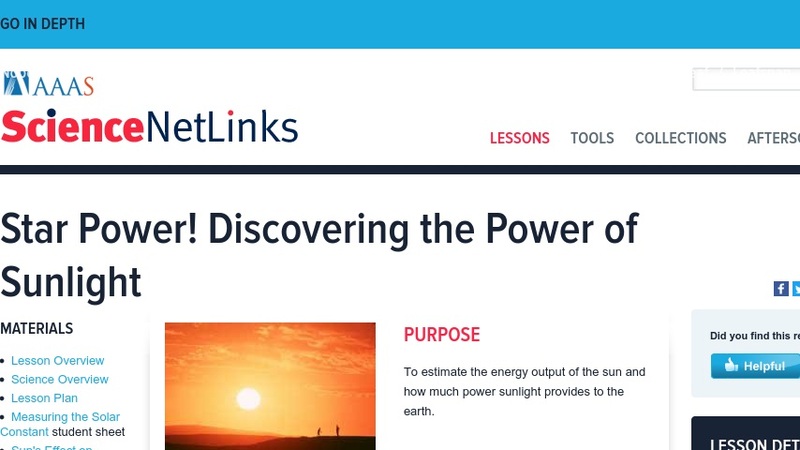 This is a standards-based experiment for grades 9-12 designed to promote deeper understanding of the sun's role in powering our planet. Students build a simple device to measure the amount of solar radiation the Earth receives from the sun. Using data from the experiment, they will then calculate the solar constant -- the amount of energy the earth receives from the sun per square meter per second. As a related extension, learners also evaluate the power of sunlight closer to the Sun—at the distance of Mercury. This package includes comprehensive content support, student worksheets with answer keys, and links to pedagogical information that addresses common student misconceptions. This item is part of a larger collection of lessons developed by the American Association for the Advancement of Science (AAAS).